I am an unrepentant hair-dyer. My hair is naturally a very cool-toned, ashy blonde. So cool-toned it is almost grey looking. Now, saying that, I need to point out that I have not seen my natural hair color since I was in 7th grade. When my roots come in, they seem to still be that ashy blonde color, but who knows. I started dying my hair when I was about 12. I stayed home alone while my family went to a football party (hello, Ohio), and walked to Revco and bought some of that orangey, penny colored hair dye that everyone loved in the 90s, and dyed my hair before everyone got home. I looked like a total badass. Since then, my hair has just been black. Sure, I've switched it up once in awhile to other colors, but nothing grabs me like the black does. It looks good with my super-paleness, it is easy to keep up, and I just like it. It is extreme, but it is also subtle in its extremeness. It's not like lime green, magenta, blue or whatever. It looks tough without being like LOOK AT ME, I AM CRAAAAAZY! 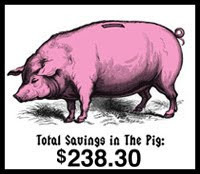 Also, it is cheap as hell. ANYWAY, so the point of this was that I was gonna tell y'all about the dye I use, and about trying out a new kind. 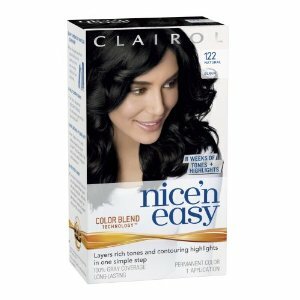 Typically, I use Nice 'n Easy regular old hair dye. I like this because it always works well and is cheap as heck (that link is 3 for $19!) There is enough to do my roots, it doesn't fade, and it takes pretty well. Even though the instructions say not to, I save old toothbrushes and use them to brush a little leftover dye in my eyebrows. It works! Your husband might make fun of you, though. Drew always laughs at me and tell me it looks like I have big mean monster eyebrows when I am coloring them >:( Be careful to just get the hair, though, not on the skin because this stuff seems to stain more than other brands I've used. 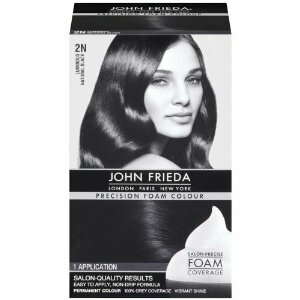 The other day I was in Target and was going to pick some dye up, and I saw the John Frieda Precision Foam Colour (ooooh, that fancy extra U!!) It was, like, 5 dollars more than the Nice 'n Easy, which is a bit more when you consider that the Nice 'n Easy is 6 dollars or something to begin with. I decided to treat myself, though, because DON'T I DESERVE NICE THINGS????? I tried it out and it was alright. On a scale of 1-10, I'd give it a solid "okay." There was more than enough dye to get alllll of my hair, and it smelled pretty good. It got most of my roots, but it didn't take on some areas around my face... I have been doing this long enough that I am very good at getting the dye everywhere and making sure to get the most important spots (like around my face.) That kinda cheesed me off a little. The conditioner was okay, seemed a little heavy, yet not as moisturizing/detangling as the Clairol conditioner that comes with their dyes. It didn't stain my skin or sink as much as other brands, which is good for cleanup, but I guess that doesn't bode well for dying your roots. I don't think I would buy it again, seeing as it is almost twice as much as my regular dye, no coupons, etc. BUT!! They DO have Nice 'n Easy foam now, too. I do like the foam dyes, because they don't drip and are easier to slap on. The Nice 'n Easy one is marginally more expensive than the regular old Nice 'n Easy, but not much. The colors are pretty much the same as the other variety, and you get the same conditioner that comes with the other one (that conditioner rules, btw, as far as little tubes of hair dye conditioner go.) 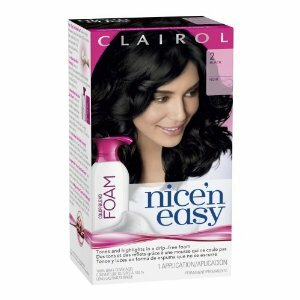 The Nice 'n Easy foam doesn't smell like flowers or whatever the hell the John Frieda one smelled like, but it does smell like BEER. It took me a while to figure out what it smelled like, and it smells like beer, but good beer. Like a Belgian ale, perhaps. Not like Natty Ice.